Processor margins have increased dramatically in this last quarter, sitting significantly higher that historical averages. The large margins have been linked with the low rainfall patterns that have occurred this year. Similar conditions were seen 2013 and if that is anything to go on the Mecardo theoretical cut-out model is projecting firmer processor annual margins, like that which were seen during 2013-15. The Figure 1 animated graphic illustrates the similar rainfall patterns that occurred in 2012-13 and 2017-18, according to the Bureau of Meteorology (BOM). From this we can see that severe dry conditions have occurred all around the eastern end of Australia. 2012-13 saw these severe conditions affect the entire eastern region whilst 2017-18 seems to be greatly affecting the central eastern and south-eastern regions. With the combination of dry conditions and the “grilling season” underway in the US, it is quite likely the coming quarters should remain strong for processor margins. The January margin in 2018 began at $45/head and throughout the quarter has never exceeded past $65, 2013 values also began low with margins ranging from $28-39. After the initial slow start both 2013 and 2018 margins rose dramatically hitting quarterly highs in May at $203 and $263 respectively. From figure 2 we can see that the seasonal margins for 2013 and 2018 follow a similar trend, they are both started near the average and dramatically increased April onwards. It is likely that this year with the combination of dry conditions and the increased rate of herd liquidation (as noted in an earlier Mecardo piece with the increase in the female slaughter ratio) that processor margins will remain robust. This trend has occurred before during the cattle turnoff in 2013-2015 where processor margins were significantly higher than average, 2014 being the strongest year with $298.83/head. The shortage of rainfall has also increased the culling rate of females, as we have now entered a herd liquidation phase. As projected in previously should the following quarter remain dry we could see any even larger increase in the slaughter ratio of females. N.B – Input data to the Mecardo cutout model, such as beef export prices/cutout values and co-product prices, can be revised post reporting each month. These amendments to can sometimes see the previous monthly margin figures revised to factor in the input revisions. 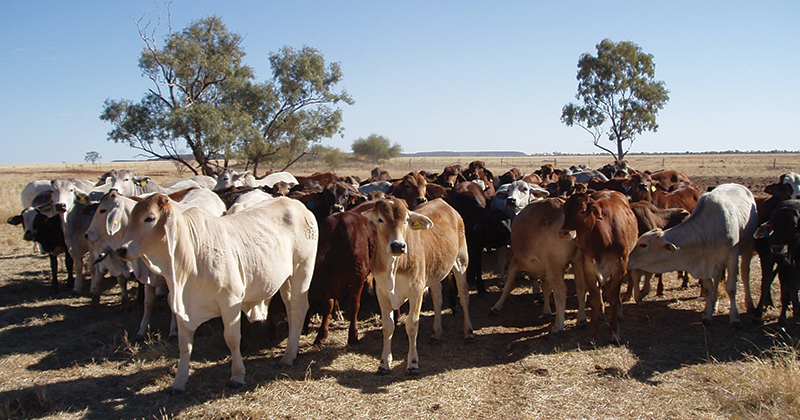 Drier conditions result in lower feasibility for grazing leading to increased slaughter rates. 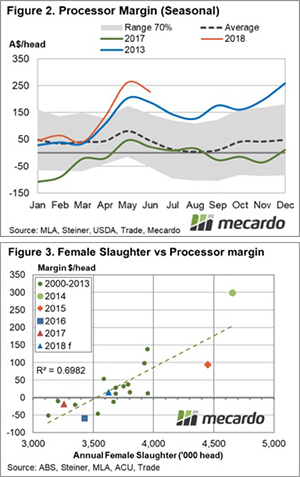 From figure 3 we can see that the high female slaughter ratio is correlated to the high margins that processors are currently experiencing. We can also see that during the 2016-17 processors saw negative margin periods due to wetter conditions generating a herd rebuilding phase. Whilst the 2013-15 periods saw robust profits due to dry conditions creating a herd liquation phase, like what we are experiencing right now. The dry forecast leading into Spring issued by the BOM should continue to support firm processor margins into the second half of this year.